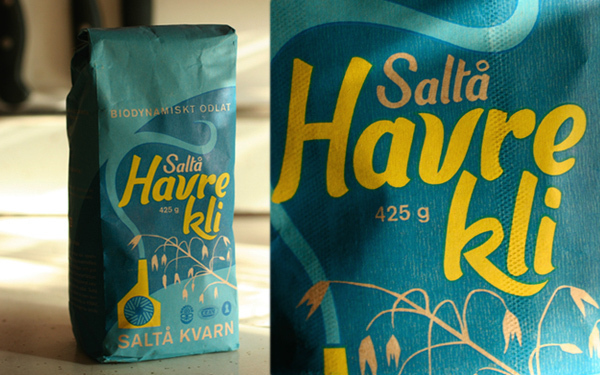 While checking out the the Urban Deli in the Sodermalm district of Stockholm, we spotted some beautiful food packaging. We didn't know what it was—and don't intend to eat it—but we bought it anyways. Turns out it's salted oat bran. I found this story about the designer behind the colorful packaging redesign. Have you ever purchased food because of the packaging? Haha, yes i have! This year i went to argentina and while hanging out at the chinese neighbourhood in buenos aires i jut wanted to buy everything just to collect the packages! My argentinian friends told me "ok, buy anything but please don't take any sweets 'cause asian cookies may taste anything but sweet" but i'd just fallen in love with two cookie pop chlidish packages, and i bought them. I took them home to montevideo and one day i decided to open them up, gosh they were delicious! Despite the deliciousness they were anything but healthy so i don't think i'll ever buy another package. I love the one you got, and that's not junkie food, ten points! Christopher, thank you for the correction :) We loved Stockholm!! Swedish chocolates' are known for their amazing taste. It looks like the packaging is designed to appeal to mothers. The typography, colors and images coordinate with each other well. This packaging can certainly encourage people to buy this product. Biodegradable packaging bags help to reduce the pollution provided the usage is held on a daily basis and it is best packaging for foods items. I use to put oat bran in everything I made. Not anymore though. I just stay away from all grain products. Yes, I have bought a food item because of it's packaging. Many of us may deny it but the appearance is a huge part of what drives us to make many food item purchases.